Should You Close Extra Credit Cards? Some of my book readers have been asking me if they should close out their extra credit cards. They may have a Visa, MasterCard, Sears, Target, Macys, Chevron, and Walmart card. They do not need all of those cards, because Visa and MasterCard will handle it all. But my answer is NO and here’s why. By closing the cards you already have open, you risk losing credit points. You gain points for having a long history of credit. By closing old cards, you could lower your average length of credit. 1) A low balance-to-limit ratio on an individual card. 2) A low balance-to-available credit ratio on all your cards. If you close out all your store cards that you don’t need, you could hurt your score per #2 above. Your balance-to-available credit ratio could go up (depending on your remaining credit). So, in general, if you have extra cards you don’t need, let them set open and unused. That way, you won’t risk losing points. What If You Only Have Three Credit Cards? If you only have two or three credit cards, that is enough and you do not need to seek out more. If you have two credit cards, plus one other trade line on your credit report, such as an auto loan or student loan, then that’s perfect. You have three accounts showing on your credit report, which is what you want for a conventional mortgage loan. Best practice for a high credit score is to keep your balance-to-limit ratio low on all your credit cards. I suggest keeping it at 30% or less. Never go over 50%, because that will dock points. And never, ever max out your cards! Thank you for reading this post. Feel free to pass it on to others via social media, because a lot of folks are using too much credit without realizing it is hurting their scores. “No thank you. I have enough credit cards,” I replied. How many credit cards is enough? At what point does having too much credit hurt your score and dock points? If you plan to apply for a home or auto loan in the near future, these are very important questions, because credit cards play a major role in determining your score. And your score dictates whether or not you qualify for the best loan at the best interest rate. “I have 17 relationships,” said a woman who wanted to buy a home. I had asked about her credit and was dismayed to learn how over-extended she was. Not only did she carry too much debt, but her abundance of credit cards put her in a below-average credit rating. If your balance-to-limit ratio is even one dollar over 50 percent, you are losing credit points. If your balance is 80 percent or higher, you are losing even more points. On the other hand, if your balance is below 30 percent of the limit, you gain points. If you have too many open accounts, your score might suffer, because you have the potential to bury yourself in debt — especially if some of the accounts are newly opened. On the other hand, if you have had ten open accounts for ten years and you have managed them perfectly, then you can still have a top score. Three open credit cards is good. Three is enough. You want at least two of those three to be a major card, such as Visa, MasterCard, or Discover. Individual store cards such as Target and Macy’s are not major cards; therefore, they are not weighted as heavily. When you have two major credit cards, you don’t need a wallet full of individual store cards. Whether you want to borrow half of a million dollars or less than a hundred thousand dollars, mortgage lenders want to see that you have a track record of managing credit. One credit card is not enough to establish a strong credit pattern. FHA wants at least two credit accounts to obtain a mortgage. Conventional loans (the preferred loan) wants at least three credit accounts. These accounts need to be established for at least six months in order to count toward your score. Debit cards do not establish credit or go on your credit report. Therefore, a debit card does not give you credit score points. Get Smart About Your Credit! Don’t be in the dark about your personal credit rating. Learn the rules so you can control your own credit score. If you have made mistakes in the past, you can start today in establishing perfect credit for your future. If your credit report contains errors, take action now and get it cleared up. Don’t procrastinate, because the credit bureaus have 30 days to investigate and respond to your request. And if they don’t get it right the first time, you might have to send a second letter. Don’t make the colossal error of ordering your credit online. Write that down and remember it. You give up important rights when you order online. Attorneys and certified credit repair specialists do not order online, and neither must you. Your credit score is vitally important. Not only does it dictate whether or not you can buy a home of your own, it also influences your auto insurance premium, your fire insurance premium, auto financing, and more. Listen Up! Credit cards are not your friends. Do not collect them like you’re collecting buddies. Credit cards are like razor sharp tools that have the ability to help or hurt. There is much more to be said about credit, and I will continue to write posts. In the meantime, please help me educate good folks by posting to Facebook, Twitter, and passing on the website address http://www.AskCarolynWarren.com. Thank you and use credit wisely! 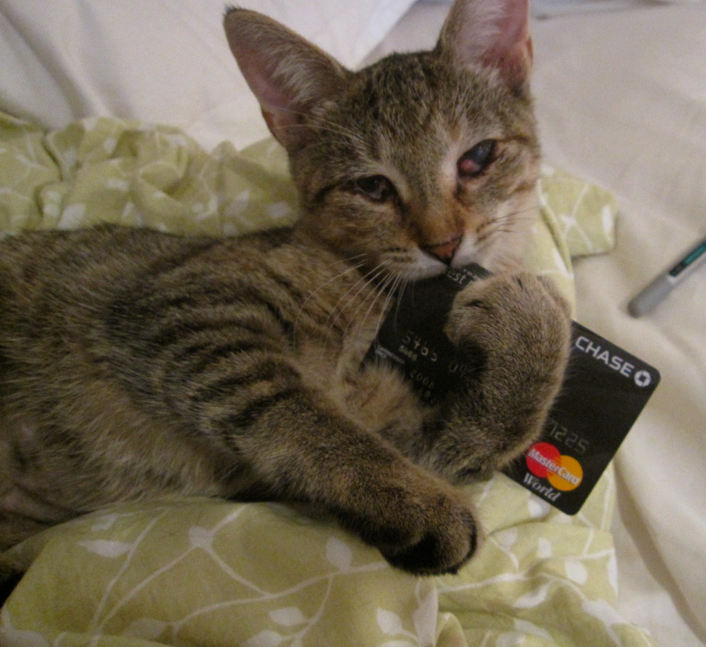 If you’re so cute you don’t need to work for a living, then don’t worry about having a credit score. For the rest of us, we need to be smart about how the system works. 1) If you carry a balance that is over 50 percent of the limit, you will lose credit points. To remedy, either call your creditor and ask to have the limit raised, or spread out your spending over an additional card. I am assuming, of course, that you are not overspending for your income and budget. That is another topic altogether! 2) If you pay off your balance in full each month, you will be rewarded with additional credit points. The credit system recognizes the proper use of credit and adds points to your FICO score when you don’t carry a balance from month-to-month. Moreover, you don’t waste your money paying interest that is non-tax deductible. Not only does the system look at your individual credit card balance-to-limit ratio, but it also looks at the total of all your available credit cards. So if you are maxing out all your cards, your score will receive a double whammy in point subtraction. 4) Any payment that is 30 days late will dock your score. If you’re 60 days late, it gets worse, and ditto for 90 days. If you are 31 days late for the first time and call your creditor immediately, they might give you grace and not report you as late, especially if you are a long-time, perfect-paying customer. If your one-off late payment has already reported, then you should take steps to get that removed from your credit report. The law gives you the right to dispute the late payment, and many creditors are happy to remove the late payment when you send the right type of letter through the good old-fashioned USPS mail system. Why? Because it is a good business practice for them, and it is within their legal right to do so. As the creditor, they own your credit information. When you understand how the system works, you are in control of your own credit score. * If you reduce the 50% credit usage to 30%, you gain even more points. Having a score of 740+ puts you in the top tier for a conventional mortgage loan. If your score is 800 or higher, you gain respect, bragging rights, and may qualify for slightly better terms, depending on the lender and loan program. 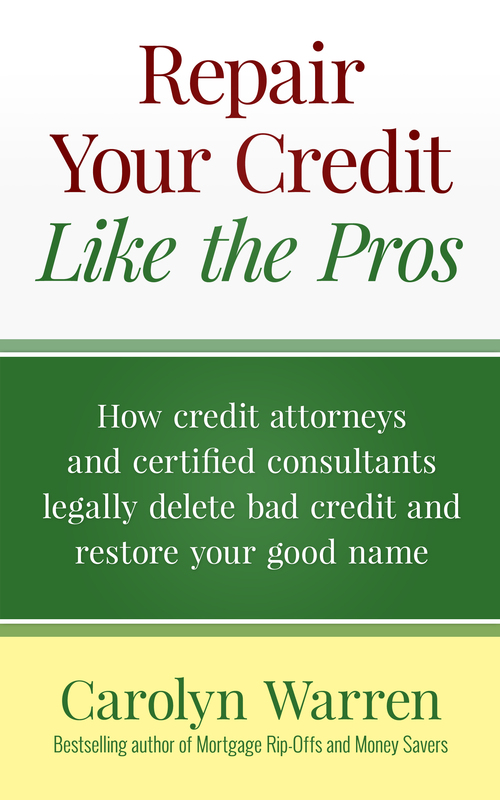 Learn what the credit professionals know that you don’t about restoring credit and your good name. I received an email from a gentleman who read this book and has been following the steps for do-it-yourself credit repair. “Three negative accounts gone, three to go,” he wrote. Yes, credit repair does work when it is done properly. Unless you’re as cute as a cat or have just won the lottery and plan to pay cash for everything for the rest of your life, you need excellent credit and a high FICO score in order to obtain the best financing, the cheapest insurance premiums, and save money.